The Palo Alto chair features two contoured walnut planes that intersect a rigid maple frame. The angles of the cantilevered seat and back offer a perfect reclining position for reading, socializing, or simply contemplating the smoothness of the glowing maple arms. Despite its crisp design, everyone is startled by how comfortable this chair is, and many have said they never expected a solid-wood chair could be so pleasant to sit in over a long period. The maple frames are available in a bleached or natural finish, and seats/backs are available in: Eastern walnut, California Claro walnut, cherry, white oak, and a variety of other native California hardwood species. Frame: Natural maple or bleached maple Seat/Back: Eastern walnut, California Claro walnut, cherry, white oak, and a variety of other native California hardwood species. 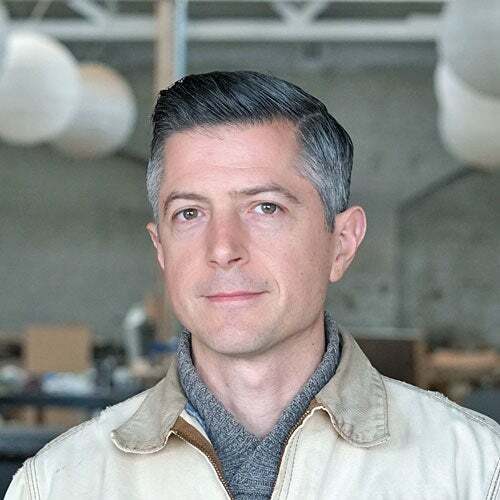 J. Rusten Furniture Studio was founded in 2002 by Jared Rusten to create compelling and enduring objects that awaken public and private space. The studio engages tradition’s best practices while pushing the craft of woodworking forward. Natural materials are elevated by composing them into simple, modern forms. Finishes are engineered to get better with age and communicate a sublime warmth and presence only possible with small scale production . Often, Jared and his team source rare and unique California hardwood species like Claro Walnut and Bay Laurel milled from fallen or displaced trees. ..... Adding its own vocabulary to the language of design, the studio has produced hundreds of original pieces of furniture for residences and commercial clients like Google, Vans, Github, and Levi’s, exhibiting work at numerous venues including the Harvard Graduate School of Design, S.F. Museum of Craft and Design, International Contemporary Furniture Fair, Pasadena Contemporary Art Museum, and has been featured in many print/digital publications like The New York Times, and Sunset Magazine ..... In 2016, the studio moved to Stockton, CA where Jared and his wife, Emily purchased a 100-year-old warehouse in the historic downtown. The ample space, proximity to fabricators, suppliers, and Stockton’s transportation nexus have allowed the studio to thrive with new designs and to better serve clients in California and beyond. 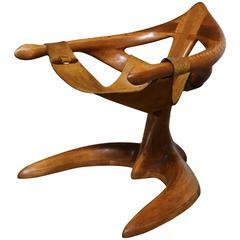 Studio Crafted Lounge Chair by Californian Woodworker Tim Crowder = MOVING SALE! Studio crafted lounge chair by Californian woodworker Tim Crowder.